Introduction: Transjugular intrahepatic portosystemic shunt (TIPS) placement is an effective management strategy for patients with variceal bleeding as it effectively decreases portal pressure and subsequently variceal pressure. Unfortunately, several risks are associated with TIPS placement as a consequence of diverting portal venous blood flow. Hepatic encephalopathy and decompensation are known potential sequelae of TIPS creation. In fact, 5% to 35% of patients will develop hepatic encephalopathy following the procedure1. The treatment options for encephalopathy following TIPS creation include medical management alone or in combination with expedited orthoptic liver transplantation, parallel TIPS creation, TIPS reduction, or TIPS occlusion1-4. The risks and benefits of each must be weighed for each patient case. Case Report: A 61-year-old man underwent a TIPS placement for the secondary prevention of bleeding from gastroesophageal varices. Before TIPS placement, the patient had previously undergone glue injection of the varices via endoscopic approach for acute gastroesophageal bleeding. For TIPS placement, a 10 mm × 7 cm Gore Viatorr stent-graft (Gore Inc. Flagstaff, AZ) was placed between the right portal vein and the middle hepatic vein. To correct the underlying main portal vein stenosis, an overlapping 12 mm × 6 cm bare metal Wallstent (Boston Scientific Inc., Natick, MA) was placed into the main portal vein (Figure 1). Following deployment of the stents, the portoatrial gradient decreased from 12 mm Hg to 6 mm Hg. At the same time, due to persistent filling of the varices, coil embolization of the varices was also performed. Four months later, the patient presented with recurrent bouts of disorientation and marked confusion leading to multiple hospitalizations due to post TIPS hepatic encephalopathy and not responding to conservative management. Before TIPS placement, there was no evidence of clinical encephalopathy. TIPS reduction was pursued. Access was obtained via the right internal jugular vein approach. A 10-F sheath was placed, and the portoatrial gradient was calculated to be 7 mm Hg. Two parallel sheaths (10-F and 6-F) were placed in the TIPS using two separate right internal jugular vein accesses (Figure 2A). A 10 mm X 70 mm Viatorr stent graft and a 7 mm x 24 mm balloon expandable stent were advanced through the parallel sheaths to the level of TIPS. The balloon expandable Palmaz stent was positioned between two Viatorr stent grafts. 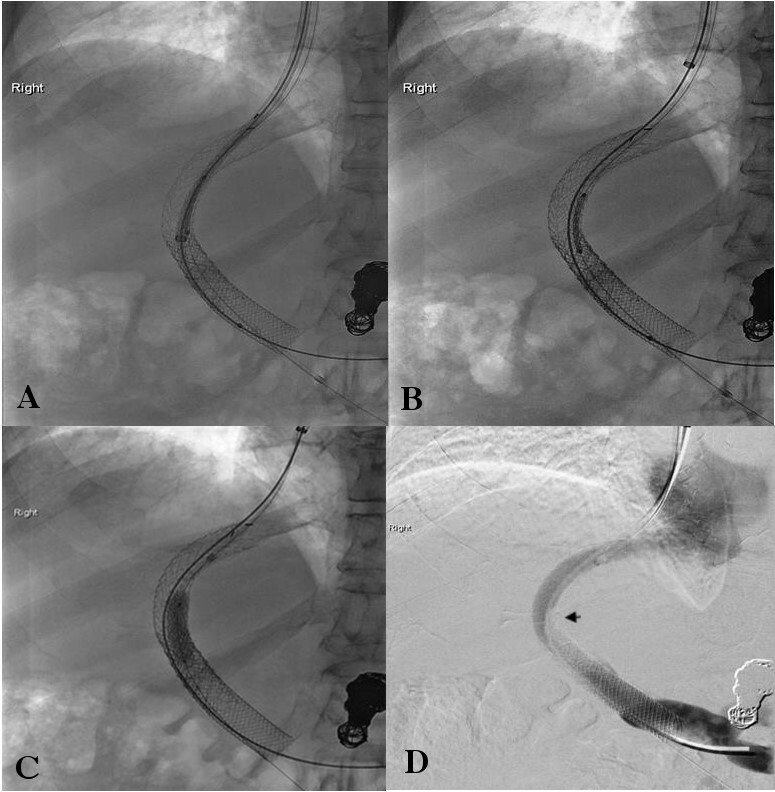 The Viatorr stent-graft was deployed within the TIPS and positioned so that the covered segment of the graft did not overlie the left portal vein (Figure 2B). Next, the Palmaz balloon expandable stent (Cordis Inc. Milpitas, CA) was deployed between two Viatorr endografts and dilated with the balloon (Figure 2C). Portogram following shunt deployment of the Viatorr stent graft and balloon expandable stent showed significant reduction in the diameter of the TIPS (Figure 2D). After TIPS reduction, the right atrial pressure measured 0 mm Hg, and portal vein pressure measured 14 mm Hg. The portoatrial gradient was calculated to be 14 mm Hg. Clinically, significant improvement was seen in the patient’s symptoms of disorientation and confusion. Discussion: Hepatic encephalopathy can occur in 5% to 35% of patients who have undergone TIPS placement1. Most of these cases can be successfully managed medically with lactulose, a protein-restricted diet, or branched-chain amino acids. However, refractory encephalopathy has been reported in up to 7% of patients and severe disabling encephalopathy has been reported in approximately 1% to 3% of patients with TIPS1-4. For patients with severe persistent encephalopathy, TIPS occlusion and TIPS reduction are well-described options. However, TIPS occlusion can lead to the return of the presenting symptoms (e.g. variceal hemorrhage or intractable ascites). Instead of completely occluding the stent, interventional radiologists can decrease the diameter of the shunt. Shunt reduction using parallel technique is a common procedure that is used to decrease shunt diameter and flow (Figure 2). Maleux et al. reported a parallel technique for shunt reduction similar to the current case5. In their technique, dual guidewire access was achieved via the internal jugular and common femoral veins. From one access, a 6 mm diameter balloon-expandable stent was positioned in the middle of the existing TIPS. From the other access, a 10 mm diameter Viatorr endoprosthesis was positioned parallel to the balloon-expandable stent. The balloon was then inflated and left inflated while the Viatorr endoprosthesis was deployed. Using this technique, clinical improvement was seen in 76% of the 17 study patients. In conclusion, parallel technique for reduction of TIPS can effectively manage cases of refractory hepatic encephalopathy. 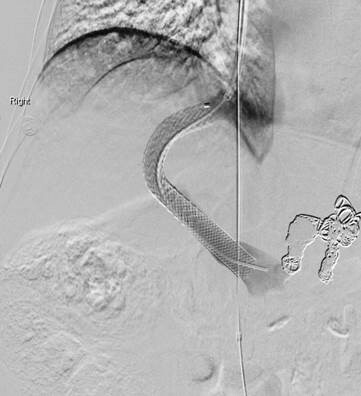 Figure 1: Digital subtraction angiographic image showing a widely patent TIPS and main portal vein stent. Also noted are coil embolized varices. Figure 2: TIPS reduction technique. (A) Placement of 2 parallel sheaths (10-F and 6-F) in the TIPS using 2 separate right internal jugular vein accesses. (B) Placement of a 10 mm × 70 mm Viatorr stent-graft within the TIPS. (C) Deployment of a 7 mm × 24 mm Palmaz balloon expandable stent sandwiched between 2 Viatorr endografts. (D) Portogram showing significant reduction in the diameter of the shunt (arrow).